Do the medications you take deplete nutrients from your body? (fast forward the audio to 6:30 to skip commercials) as Dr. Osborne discusses the topic of drug induced nutritional deficiencies. Many commonly prescribed medications can interfere with the body’s ability to absorb and utilize nutrients. For example, Lipitor, which is commonly prescribed to help lower cholesterol, can deplete the body of coenzyme Q10 (CoQ10). A CoQ10 deficiency can cause high blood pressure and congestive heart failure. Thus treating high cholesterol with this type of medication may increase the risk of heart disease. Commonly prescribed pain medications interfere with folic acid, iron, and vitamin C. These nutrients are necessary for your body to repair joint cartilage and reduce the chemical inflammation that leads to pain. 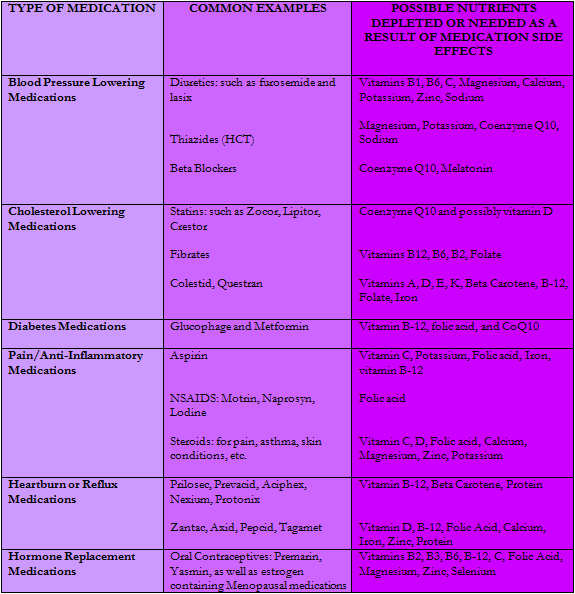 Below is a chart of commonly prescribed medications and the nutrients that can be depleted while taking them. Why Didn’t My Doctor Mention This to Me? Unfortunately, nutrition is not a topic commonly taught in traditional medical curriculum. Many doctors are unaware of this problem and therefor fail to mention it. Next time you visit your doctor, make sure to ask about drug induced nutritional deficiencies. Don’t blindly accept a medication without knowing the nutritional side effects involved.